Non-stop flights from Frankfurt to Seychelles for €354..
Flights from Europe to remote Falkland Islands from €500 (£449)..
German leisure airline Condor offers affordable non-stop flights from Frankfurt to amazing Seychelles for €354. This is including all charges and in flight meals. Only hand bag in base fare thought and you can purchase 20kg hold baggage for additional €40 both ways. (In such case you need to book directly with Condor Flugdienst). You can also depart from other main airports in Germany (Munich, Berlin, Dusseldorf, Stuttgart etc.) or other European cities however with routing via Frankfurt. Looking for a direct connection to this tropical paradise you will find very limited travel options in last quarter of this year..
As mentioned only very limited availability though so hurry up if interested in this solution with Condor. Below you can find booking sample as well as travel samples. Look for flights in January or February 2019. Need affordable hotel in Mahé you can book your accommodation via Booking.com or Hotels.com. 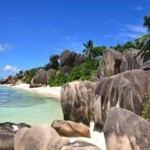 If you have booked these cheap non-stop flights from Frankfurt to Seychelles you can also compare best prices for car rental in this destination via Rentalcars.com. Booking sample of a non-stop flights from Frankfurt to Seychelles for €354.. As per our above booking samples you would depart from Germany to this exotic destination on 29th of January. Your return flight form Mahe back to Europe would be then on 6th of February 2019.